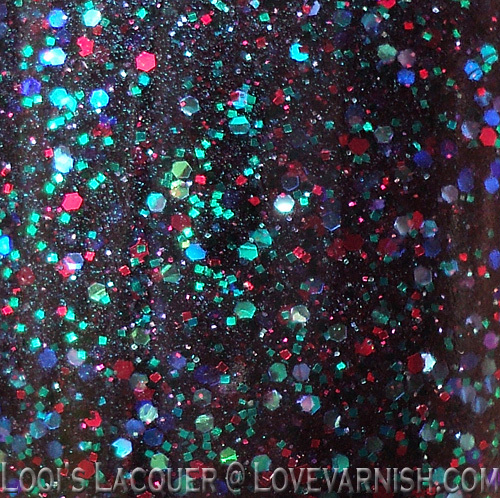 Love Varnish: Shimmer Swatchathon! Recap, Review and Favourites! Shimmer Swatchathon! Recap, Review and Favourites! Hi guys! As I promised you last Monday I have an extra post for you this week! I wanted to do a recap post about all the gorgeous Shimmer polishes I have been swatching for you. I've posted so many of these polishes now over such a long stretch of time that I thought it would be nice to do a final big post about them, recapping all the info about the brand, my swatching method, pros and cons of the polishes, and my favourites. First off I want to say I had so much fun swatching all these polishes for you! 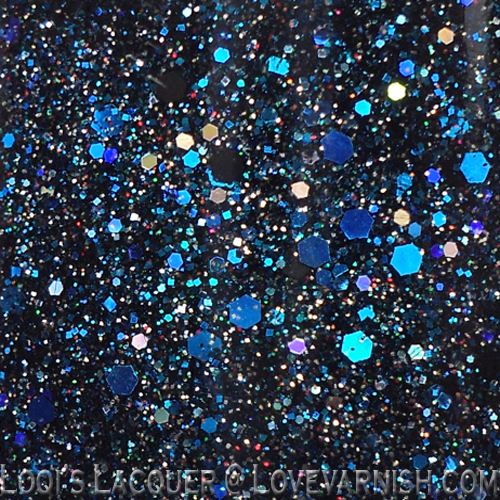 Shimmer has so many gorgeous polishes that it was truly a pleasure and totally worth it finding glitter in my house for the next couple of years lol. I also had a lot of trouble picking the polishes I liked best. I've added a whole bunch of pictures of my favourites to this post, but I liked so many of them that it was very hard to choose. I think that, now I am done swatching these, Deborah and I have most, if not all, of the current Shimmer polishes on the blog! So if you are curious about all of these gorgeous polishes, or are looking for swatches of a specific one, you can use the little pull down menu on the right side of your screen to look for them! I would like to give you a small list of good and bad things about these polishes. Please keep in mind that this is all my personal opinion and you may or may not agree with some or all of these points. But if you are looking to purchase these pretties you might find it useful to read. Removal is a pita. 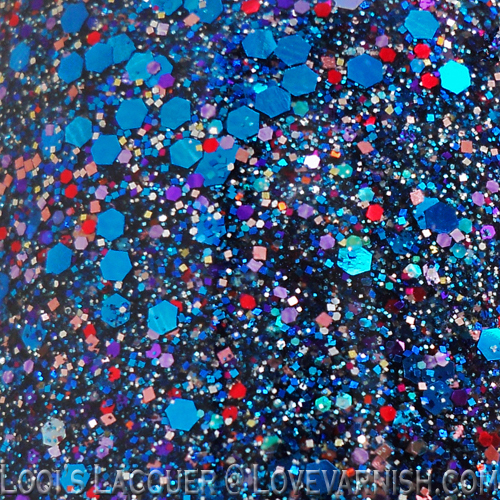 This goes for all glitter polishes and Shimmer is no exception. Be prepared to scrub long and hard when removing these polishes or use a peel-off basecoat or the foil removal method. 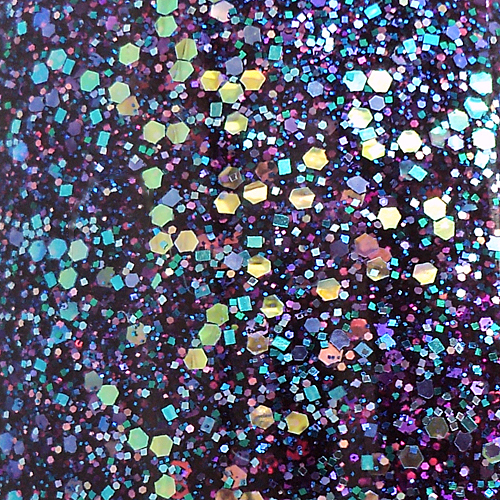 You will find glitter everywhere later. Overall Shimmer polishes are a very big winner in my book! I adored 95% of the polishes I swatched and the ones that I didn't like just didn't appeal to me colour-wise, they were all of the same great quality. 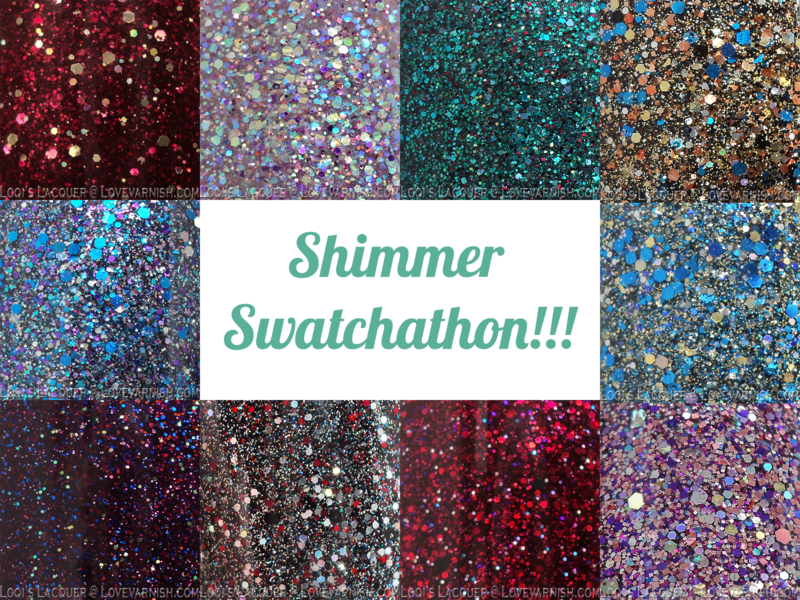 I really hope you guys had as much fun as I had with this Shimmer Swatchathon and that I didn't put you off with an overkill of glitter or this long essay! Please let me know in the comments if you already have Shimmer polishes yourself or plan on getting some and which ones are your favourites! I hope you guys enjoyed this post and see you on Monday! Shimmer is an indie brand based in the United States. 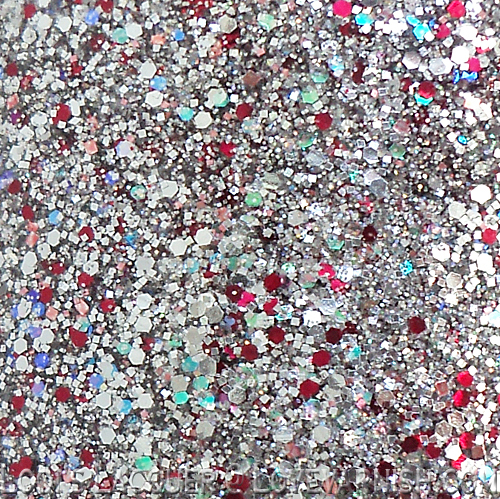 The polishes are made with high quality ingredients that mix well and do not degrade over time. 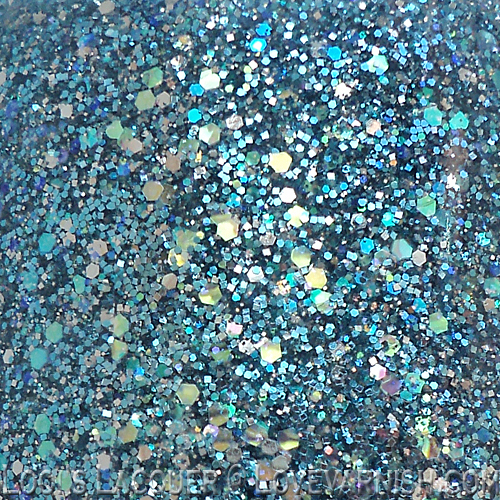 All polishes are available at the Shimmer website or Etsy for 12$. You can also connect with them on facebook. I love Shimmer! They are all so pretty! You did such fantastic swatches! Cleo and Taylor are so pretty. Your swatches and reviews of these were great Loqi!! I agree 100% on your summation of Shimmer polishes. They're some of the prettiest, most well behaved glitters out there... a few are pretty similar. Favorites-- Carol was the one that really made me sit up and take notice. I really like Cleo, Celine, and Tracy, too. Such gorgeous combos. I think I like Taylor best! What a great recap post...I love the macro shots!! So much pretty for one post!! These are all stunning. I have loved seeing all of your Shimmer polish posts! All of them are beautiful! Thank you Kerry! I am glad you enjoyed them! Thank you! It was so hard to pick my favourites! I could have put 10 more in there if I wanted to! Taylor is in my top 3 I think! That teal shimmer! They really are, even better in real life! :D It's the little things right? Thanks so much Emily :D I am glad you enjoyed them! I can't decide which one I love best... Stephanie, I think! I really like Shimmer. I have a few of their polishes and I've always been very pleased! Great recap! I love my Shimmer polishes, although I will admit that some look very similar. Stephanie really is pretty! I can't get over how awesome that little bit of red glitter looks! They really are great quality! Which ones do you have? Those are some serious glitter bombs! I have enjoyed seeing them all! Just being honest, these are awesome polishes! Thank you for giving me a chance to try them! Great review and thanks for mentioning the texture of the polishes once they dry down.